Features : Houbara bustard is known as one of the beautiful and mangificent birds of deserts. Maximum body length (bill to end of tail) is 65 cm, in shape resembling a female turkey. Male and female are outwardly similar, however males are about 10% larger in size. Neck and tail are noticeably long, wings comparatively narrow. Both sexes have large eyes, short black and white crest and tufts of long black and white feathers drooping over the neck. Males have ornate bristles on the head and neck. The plumage is mainly brownish-buff with wavy lines; under-parts are white, with greyish throat. The top of the tail is grey with darker vertical markings. Immature males resemble females, however, less ornate feathers are seen on the female's neck. Ch. undulata fueraventurae is the smallest sub-species living in the Canary Islands. Habitat : Desert and semi-desert regions, open savannas with vegetation cover that has a maximum height of 2 m., grassy plains and stony or sandy steppes. In spring and summer, they are sometimes seen around agricultural land. Distribution and Migration : Bustard is a migratory bird, however in some places such as West Palearctic, Armenia, Syria, Saudia Arabia, Kuwait, Pakistan, Egypt,Iraq, Libya and Iran, they are regarded as native. The sub-species, ch.undulata macqueenii breeds in the Middle East, particularly the Southern regions of Asia and Middle East. Migratory birds travelling to Iran, fly from the neighbouring countries like Turkmenistan and Kazakhstan at the outset of autumn, sharing the same habitats as the native birds. 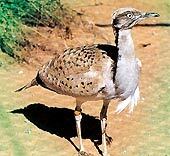 Food : Houbara bustard is omnivorous, consuming a great variety of seeds, fruits, insects and small vertebrates such as lizards, and invertebrates. Behaviour : The most interesting behaviour of Houbara bustards is seen during the irelaborate terrestrial courtship displays. The male inflates the crest, neck and head feathers, raises the wings and while walking slowly and gracefully, keeps the tail raised like an umbrella and occasionally lowers the wings. Then suddenly, he begins leaping back and forth, all the while, trying to attract a female. Houbara bustards are monogamous. Bustards lay their eggs in a scrape on the ground, usually sandy ground, and fill it with feathers or leaves and twigs. Houbara bustards prefer to make their nests in the shade, like underneath bushes, so as to be protected from direct sunlight and hidden from enemies.Eggs are greyish olive in colour with numerous brown spots. Houbara bustards lay a total of three eggs. The size of each is on average 65*49 mm and weighs between 67-68g. they sometimes lay between 4-5 eggs, as does the macqueenii race. The young are nidifugous and hatch covered in down, leaving the nest after a short period of about one week, during which they are fed by the female. The young are able to fly about 35 days after hatching. Conservation : In the past, Houbara bustards were seen in great numbers in most of the desert regions of Iran; however, in recent years due to the destruction of habitats, and over hunting, their numbers have greatly fallen.The Department of Enviornment in Iran has taken measures to stop this trend.Therefore, like the Arabian countries and Spain, it has set out to rear Houbard bustards artificially, but the results are still unknown. Despite this department's endeavours to prevent habitat destruction and control hunting, it seems that because of the extent of houbara's habitat and range, not enough has been done. What is necessary is an increase in the public's cooperation and awareness of the importance of the conservation of Houbara bustards as a part of the country's animal diversity.